The Tithe Records are often seen as census substitutes for the early part of the nineteenth century and also as a kind of valuation record. Most family historians treat it as the former rather than the latter. Either way, as you will see below, it often falls short on both counts. The tithe was not a tax but a charge upon land. The tithe system, which nominally earmarked one-tenth of the produce of the land for the maintenance of the clergy, was introduced in England as early as the eighth century. It was introduced to Ireland during the reign of Henry II, although it was not paid outside the area around Dublin until the reign of Elizabeth I. In Ireland, because the tithe system was used for the upkeep of the Established Church only, it caused a great deal of unrest among Roman Catholics and Presbyterians. Until 1823, the tithe was paid in kind by occupiers of land to the Established Church [churchlands and towns being exempt]. Between 1823 and 1838 a series of Tithe Composition Acts led to payment in kind being replaced by payment in cash. This change necessitated the valuation of the individual townlands within a parish liable for tithe. The results of this valuation were recorded in the Tithe Applotment Books and these are organised by barony and parish. There is not a separate book for each townland. All townlands within a parish are in one book. Note also that in Co. Derry some townlands were not in the same parishes in 1823/38 as they were in the Griffith's Valuation of 1858/59 - see the paper Townlands in Co. Londonderry and their Administrative Divisions [at the Administrative Divisions link in the top menu] for details. The original books are held in PRONI and are catalogued under FIN/5/A. Note that the books are also available on microfilm in PRONI - MIC15AA. The books contain lists of names but it must be remembered that these only include the landholders, or to be more accurate the persons who held the leases in the various parts of a townland. In my experience, the persons listed in the Tithe Applotment Books are usually the main leaseholders in the townland at that time. These leaseholders would have been responsible for collecting the tithe from any sub-tenants. Also, the fact that a name is listed in a particular townland, does not necessarily mean that the person lived there. Nevertheless, the Tithe Applotment Books are a valuable source for a period where evidence is scarce. Note that I am using the term leaseholder rather loosely here. Many 'leaseholders' in some townlands were merely tenants-at-will i.e. they did not have a proper lease. They held their land on an annual basis. In fact in townlands where this was prevalent, more names are usually listed. Click here to see a copy of part of a page from the Tithe Applotment Book for the Parish of Maghera. It lists the landholders liable for tithe in part of the townland of Gorteade, near Upperlands in South Derry. The total acreage liable for tithe is shown in column three, followed by columns which give a breakdown of the acreages of different qualities of land within each holding. Note that all of these acreages are in Irish acres. The final column in the original document [not shown in this copy] states the amount of tithe to be paid per acre on each holding. The average tithe per acre was around one shilling - five new pence in today's decimal currency. Multiplying the acreages in the Tithe Applotment Books by 1.62 will convert them to English, statute, acres. In other areas of the county, such as the townland of Lisbunny in the parish of Cumber Upper, the acreages were given in Cunningham acres, which is a Scottish measure. Multiplying Cunningham acres by 1.3 will convert them to English, statute, acres. In my experience the acreages given in Co. Derry parishes tend to be in Plantation acres [i.e. Irish acres] whereas those in Co. Antrim tend to be in statute acres [English acres] or Cunningham acres [Scots]. For an excellent short paper on the historical background to these various measurements read this paper What size is an acre? by George Gilmore of Garvagh Historical Society. Finally, the PRONI Information Leaflet on the Tithe Records is worth a read. I have found that in those Tithe Books where acreages are given, I can match some of the names with those in the later c.1860 Griffith's. As many of you probably know there is a database of the names in this source available from IrishWorld that covers the six counties of Northern Ireland. Ballymoney Ancestry includes some parishes for the Ballymoney area on its website. Whilst these databases are useful in identifying particular names, it is not possible to filter out particular localities within counties which would allow us to compare names in a locality c.1830 with names in the same locality c.1860 Griffith's Valuation and, indeed, the 1901 and 1911 Census Returns. However, I have neither the time or the energy to create a database covering North & Mid Antrim plus the whole of Co. Londonderry. What I have done is for Co. Antrim & Londonderry is outlined below and work is still in progress. To date I have completed a database that contains an index of names for the parishes and townlands in the Baronies of Cary, Lower Dunluce, Upper Dunluce and Kilconway; plus the parishes and townlands in the Barony of N. E. Liberties of Coleraine in Co. Londonderry [a total of 8709 entries]. Note that, in some cases, I have included the valuation of holdings and the amount of tithe paid on a holding. This kind of information is not dealt with consistently across the parishes - sometimes both the valuation and the amount of tithe paid is given - sometimes only the tithe paid is included. Initially I included this information because, at times, I have found it useful when trying to identify an individual or locate a holding. However, the amount of time involved in recording this type of information can be considerable. This explains the fact that I have not been able to complete this part of the database. So, remember, a blank entry does not mean that the info. is not available in the original document. Below you will find an Excel link and two PDF links to this database. Note that in the PDF 2 file the database is sorted by Standardised Surname, Barony, Parish and Townland. Note also PDF 2 does not include any of the statistical information mentioned above. This file is essentially a names index. The organisation of the PDF 1 file and the Excel file is very different. Here the database is sorted by Barony and Parish. Note that the order of the townlands within each parish is not alphabetical. It reflects the order of townlands within each Parish Tithe Book. Note, in particular that the names of the landholders paying tithe in each townland follow the order of their names in the Tithe Book. The order of the names and townlands in the Excel & PDF 1 files will allow you [at townland level] to compare the names of the landholders in the Tithe with those in the printed pages of the c.1860 Griffith's [Tenement] Valuation [available at askaboutireland.ie.]. This is possible because both sets of names follow some sort of geographical order. You will have to identify this order using the later Griffith's Valuation c.1860. Below are PDF files which contain the names of the landholders in a number of townlands within the county where the tenants paid tithes. 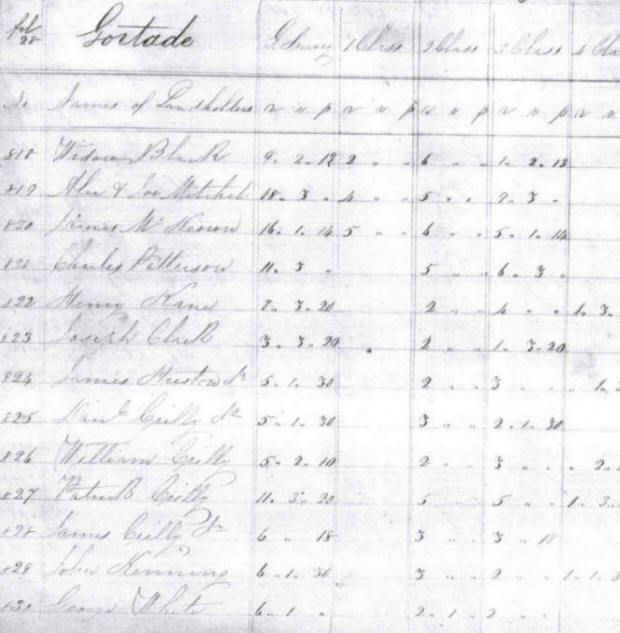 It is interesting to compare the number of landholders [paying tithes] in a townland with the number of householders in the same townland in the 1831 Census Returns. It should illustrate the shortcomings of the Tithe Books as census substitutes and make us appreciate the value of the 1831 Census for the county, despite its shortcomings. Note that the acreages given in these PDF files are in English, Statute acres and are decimalised. Note that the acreages in the Co. Londonderry Tithe Books are in Irish [Plantation] measure. I have converted them to English [Statute] acres by multiplying the Irish acres by 1.62. The result is given in a decimalised form e.g. 2.5 acres instead of 2 acres, 2 roods and 0 perches. Coleraine Aghadowey Cullyramer 1834. PDF . . . .
Coleraine Errigal Coolnasillagh 1835. PDF . . . .
Keenaght Bovevagh Drumadreen 1827. PDF Derrynaflaw PDF . .
Keenaght Dungiven Ballymacallion 1834. PDF . . . .
Tirkeeran Cumber Upper Lisbunny 1828. PDF . . . .
Coolafinny 1835. PDF Muff 1835. PDF . .
Tirkeeran Clondermot Ballyoan PDF Lisneal PDF . . I have been working on a database of the Tithe Applotment Book for the entire parish of Ballynascreen in the Barony of Loughinsholin, Co. Londonderry. Recently I have added the parishes of Kilcronaghan, Killelagh, Maghera and Termoneeny. This larger database has 3533 entries. Here I have included the acreages of the holdings for each landholder within each townland, as given in the Tithe Book. These acreages are more cosistent because they are usually in Irish acres. To convert Irish acres to Statute acres, multipy the Irish acres by 1.62. Note that the Excel file is sorted by Record No. which reflects the order of both townlands and names in the Tithe Applotment Book. The PDF file is sorted by surname as spelt in the Tithe Book. Note that the the names in these Tithe Books can often be matched with the names in my1831 Census database and the later 1859 Griffith's Valuation Book, which is available online.